I accidentally picked up Sage for this episode. I couldn't help it; they were the first release! Due to the minuscule differences, I'll most likely be archiving Yagami because of their prettier typesetting, but I really need to get into the habit of waiting. My bandwidth cap won't let me download multiple releases. This episode was the long-awaited introduction of the final member of the group, the foreigner Tachibana Chizuru. Despite being quite obviously non-Japanese (with blond hair and blue eyes), his Japanese name suggests that he may be half-Japanese (or that he adopted a Japanese name for easier interactions). The episode didn't beat around the bush at all, jumping right into the introduction of the transfer student after the OP. 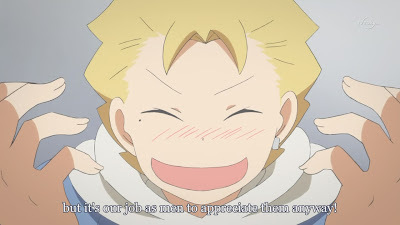 As expected, Chizuru was quite excited and outgoing, obviously geared up to fill out his role in the group. He's like a bouncy ball. 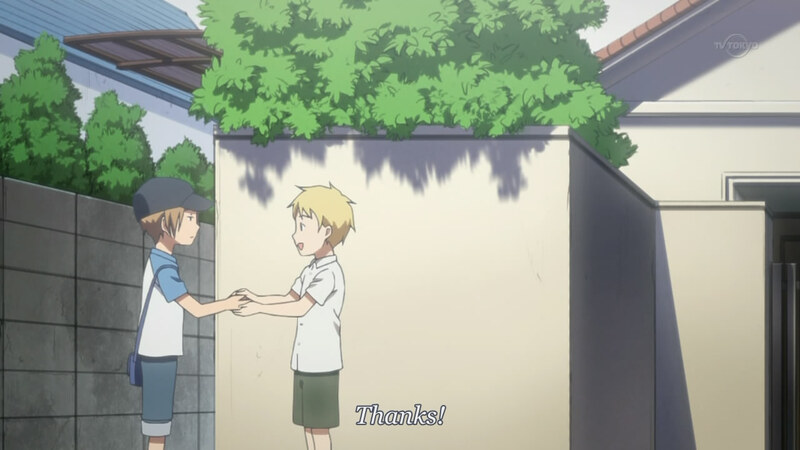 It took a few minutes after he sat down, but Chizuru ended up recognizing Yuki as the kid that he had met once in his childhood. (It was mentioned, after all, that Chizuru was "returning" from abroad.) 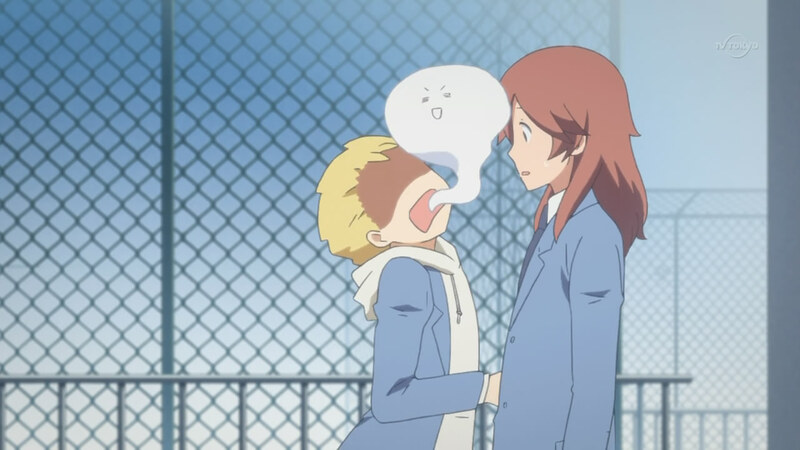 Yuki was not really receptive, however, insisting that he had no idea who this boy was. During the break between classes, he went to hang out around Yuta, although Chizuru found him quite easily. I can see that this blond boy will fill not only the boisterous role but also the dense one, as his first thought upon seeing Yuta together with Yuki was that they were clones, genuinely sounding surprised when it was revealed that they were twins. So, he's either going to be a ladies' man or a wannabe. I think the latter would be funnier. The next few scenes dealt with Chizuru attempting to get Yuki to remember him, including as they lounged by the poolside by the gym class. It became obvious that Yuki had some kind of recollection, but was not admitting to it. While the twins were at the bookstore (Yuki reading the manga chapter from the magazine, while decided whether or not to buy it), Chizuru recalled that he had given Yuki a "cool toy" outside of the park at the end of their meeting and relayed the information over. 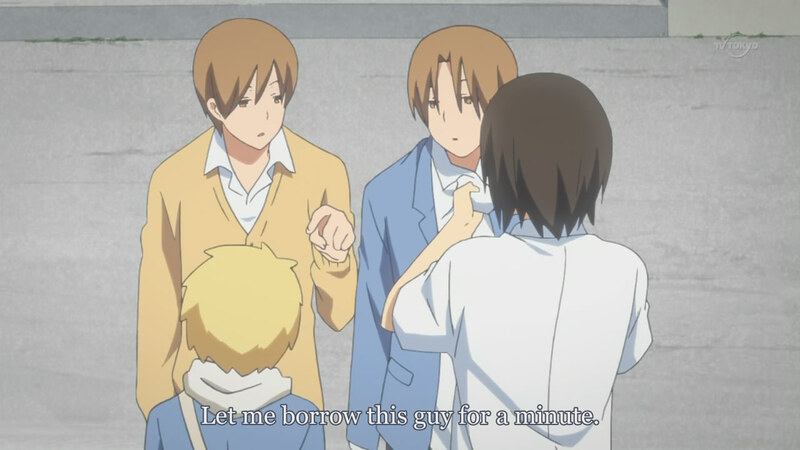 I was actually taken back a little when Yuta revealed that he remembered something like that happening, bringing up the question of who it was that Chizuru had made friends with. With neither of the twins wanting to accept that they knew him, Chizuru's dejected expression actually made me extremely sad. 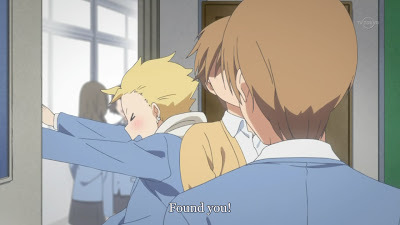 I'm not good with themes of loneliness, which is partially why Natsume Yuujinchou has stuck with me so much, and it was hard to see Chizuru being so downtrodden. He stopped approaching Yuki (which seemed like it bothered him as well) and kept all of his thoughts to himself. 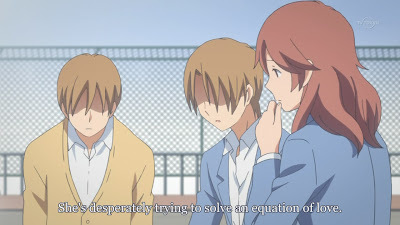 However, when approached by a bunch of high-and-mighty seniors (bullying is rampant in Japanese schools, isn't it...), Yuta and Yuki came to his "rescue" without hesitation. Ah, these twins. So calm. I had hoped for some "cool action" to take place, but that really wouldn't be in the twins' characters. Instead, I got a quirky handling of the situation that actually made me like the dynamic of these boys a lot more. Yuta stepped in instantly, just curiously asking what was going on. As he became the next target, Yuki came over since he had finished his manga volume and asked Chizuru where the next one was. As he began taking the blond boy away to go search out the next part of the story, Yuta pretended the principal was around to give all three of them the chance to run away. It was a cautious and non-violent way of dealing with the situation, one that I feel is far more realistic than the typical display of jumping into an actual fistfight. Aw~ Young children really don't look so cute, though. While the boys ran away, Yuki had a full flashback about what had happened years back. It was a little unclear if he had remembered all of it from the beginning, or if bits and pieces had come to him until the big picture showed up at this very moment. Either way, it was during a time in summer when Yuta was sick and so Yuki was at the park all by himself. Chizuru showed up, not knowing a word of Japanese at the time, and the two wordlessly got along and played together. The scenes of the two young boys was really cute; it was especially nice to see Chizuru's personality showing despite the language barrier (which wasn't really a barrier for me, considering his words were translated in the subs along with Yuki's). 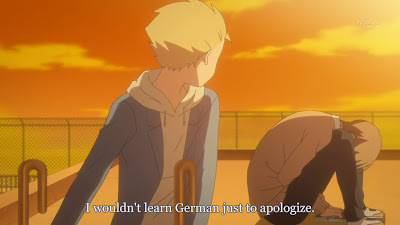 I'm sad to report that this was the only time I was sure it was German being spoken. Essentially, Yuki was hesitant to see Chizuru again since their last play-date had ended with the blond boy falling out of a tree and getting a gash on his stomach. Chizuru wasn't mad, but Yuki felt insanely responsible and muted since he couldn't even apologize. So, when Yuki got sick and couldn't go outside, he seemed a little relieved. Chizuru waited outside the park, as he was about to leave, and found Yuta running an errand. Thinking it was Yuki, he handed over the "cool toy" that he had won in a vending machine on their first meeting and ran off. Yuta immediately passed the toy onto Yuki, not knowing its full significance, and Yuki was overwhelmed with guilt at what had happened. 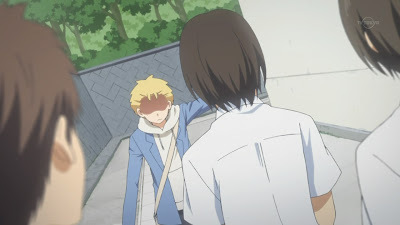 The scene after the flashback ended was a little difficult to understand, as it was interspersed with Yuki standing on the rooftop during daytime (while his encounter with Chizuru, the "real" scene, was happening at sunset). 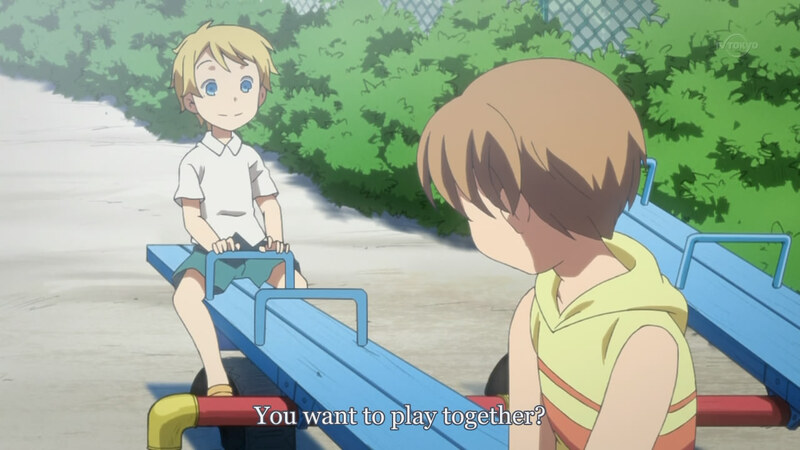 Either way, Chizuru found Yuki and commented that it was definitely him and not his brother that he had played with as a child. He also commented that they weren't clones; Yuki simply kept reading manga in the face of danger, after all. Yuki's comment that Chizuru should have pretended it was Yuta he knew made it clear that he still felt guilty; this emotion was a little alleviated with Chizuru revealing that, despite it hurting, he hadn't wanted Yuki to apologize at the time. Essentially, he had never blamed Yuki or felt angry. I'm glad Masaki likes Shun. It's interesting.